I happen to find kale to be delightful. I recognize that it’s not for everyone, but it suits me just fine, and my diet and sandwiches are so much the richer for it. It’s not just one of those good-for-you-might-as-well-eat-it foods, but an earthy, full flavor that works well with a great number of things. Three of the sandwiches here are built to star kale, but it goes just as well in a supporting role, working behind other ingredients. It’s versatile and delicious, and what more could you want from a sandwich ingredient? To start with, my method for all of the following was to separate the leaves from the stems, discarding the latter. The kale is blanched in boiling water for 4 minutes or so, then run under cold water until cool. You can eat it right then and there, if you prefer, or you can put it in a pan with a bit of fat, some spices, and some liquid (broth, wine, water all work) then cover it until the liquid is absorbed. That gives you a batch of kale ready to be deployed in virtually any instance. 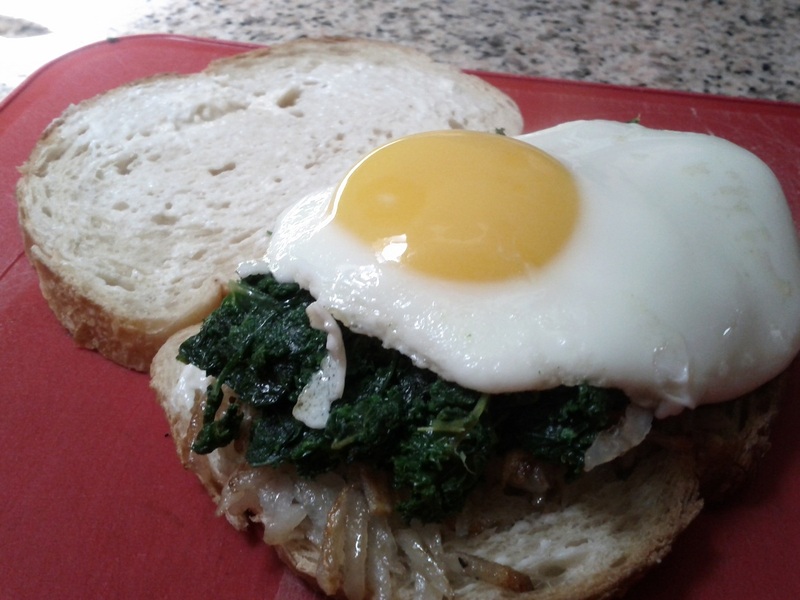 First up, kale with hash browns and a fried egg. This went on sourdough, and is a good example of the sum of the parts being enough. Kale, hash browns and fried eggs are all delicious, and putting them together simply makes for a delicious combination. It’s not more than what you would expect, but since what you would expect is pretty stellar, there’s not much to complain about. Some hot sauce or a good dose of black pepper would also go well here, and adding onions, garlic, peppers or whatever else you like to the hash browns couldn’t hurt. This is kale with roasted garlic, sauteed red onion, and a mustard vinaigrette. This wasn’t bad by any stretch, but it’s the runt of the litter. It’s tasty, with a nice savory profile, but it doesn’t feel like anything special. The main advantage here might be that depending on what kind of pantry one keeps, this might be the easiest one to put together at a moment’s notice, especially if you just go with straight red onions and not ones that have been cooked down. This is ricotta cheese and kale that’s been sauteed with butter and red pepper flakes. 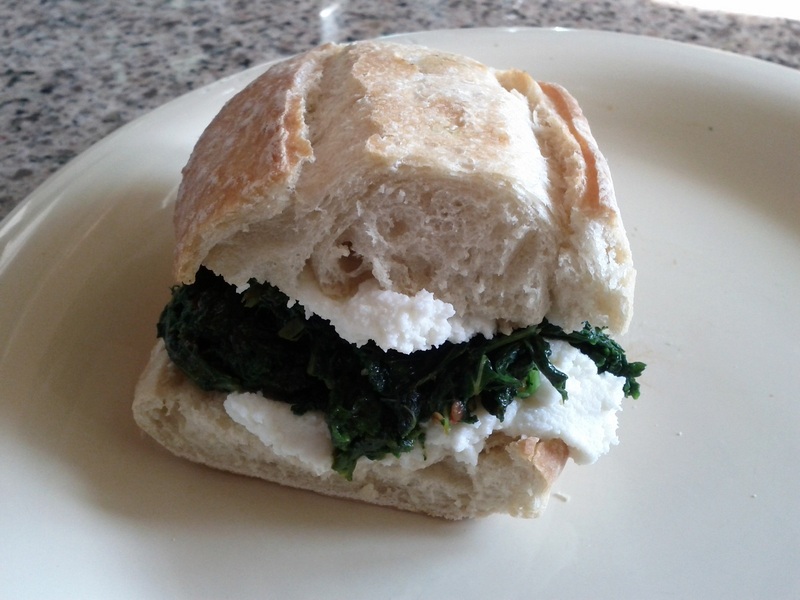 The idea for ricotta came not from the artichoke hearts sandwich, but was simply jacked whole from a Scanwiches post from some years back, which they credit to BKLYN Larder. Regardless of its providence, it is a fantastic concept. Simple, rich and creamy, this is the best way to highlight the kale. Ricotta is flavorful but not assertive, and it forms a spectacular background with which the greens can work. Now, Kale not need be the exclusive providence of the healthy eating crowd. 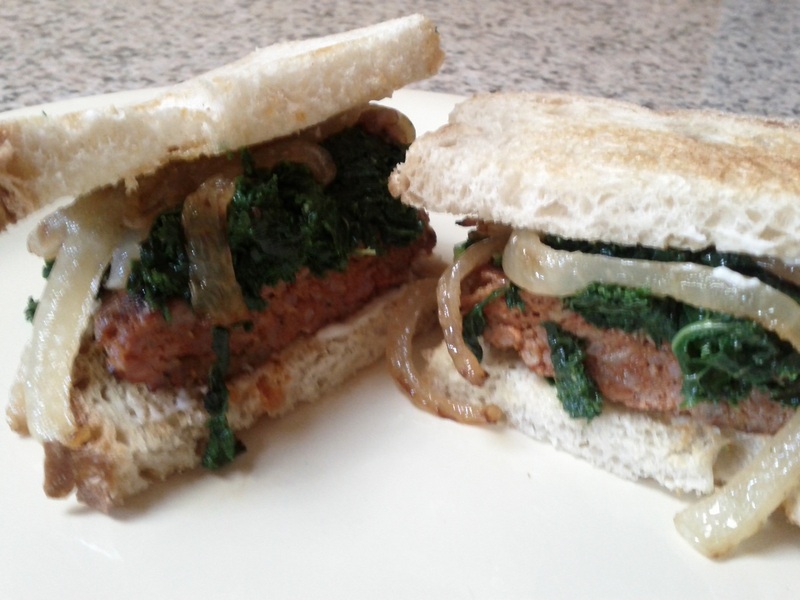 There’s no reason one can’t get some fresh chorizo, fry up a sausage patty, saute the kale in the sausage fat, and pile it all on some sourdough with some caramelized onions. There’s nothing preventing that at all, and I’m happy to report that if one does just that, one ends up with an incredibly tasty sandwich. The kale is as rich and earthy as ever, and the spicy sausage cuts through that just beautifully. There it is. Ways to celebrate a delicious green in ways from fairly-healthy to not-so-much. It’s a delicious food in and of itself, and as is so often the case, that just means it’s capable of carrying some pretty tremendous sandwiches. 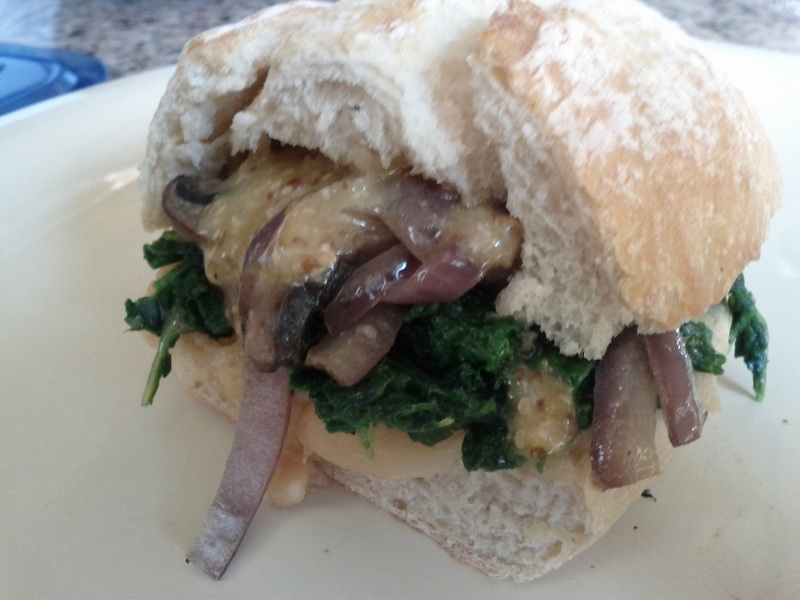 This entry was posted in Sandwich Reviews and tagged Pork, Reviews by Pete, Sandwiches I Have Made, Vegetarian by Pete. Bookmark the permalink. As always, the pictures and descriptions leave me hungry after visiting this site. The only difference is that this time, it’s with an ingredient I wouldn’t have expected to have that effect. Well done.